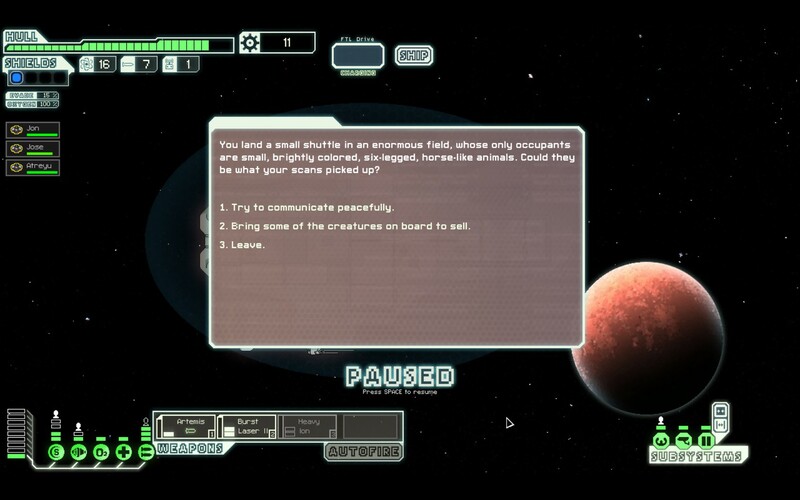 FTL: Faster Than Light: I Got This, I Got This…I Don’t Got This. The roguelike genre has always been on the periphery of my gaming world; sitting in the corner with its randomly generated levels promising me all sorts of wonders should I take the time to play through it. Of course it’s a fool’s gambit since the Roguelike genre dictates that your path in the game will be a slave to your computer’s random number generator forcing you to make the best of the situation that you’ve been dealt. I think it’s this exact reason that I avoided the genre for so long, I’m not the kind of player who likes being out of control of a situation especially when if a wrong move means I won’t be able to reload and try again. You’d then think that FTL: Faster Than Light wouldn’t get a look in but it overcame the barrier by being in space and having several recommendations from friends. 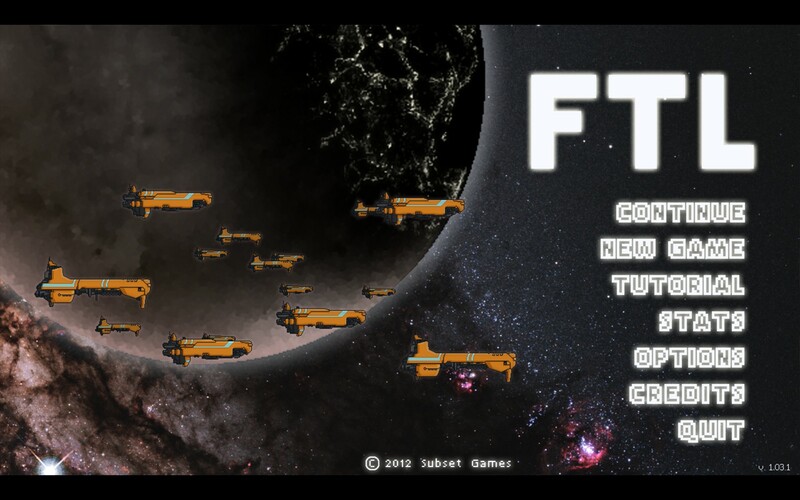 FTL puts you in control of a small federation ship that has intercepted a data packet from the rebel fleet that’s hell bent on taking your empire down. This data could prove to be invaluable in stopping them so it’s up to you to get back to your fleet in order deliver this information. You’re a long way away however and the rebel fleet is hot on your heels, forcing you to venture through some sectors of space that you probably wouldn’t have gone through in the first place. Indeed space seems to be a rather hostile place as you’ll face many obstacles along your way and even upon reaching your final destination there will still be many challenges for you to overcome. In typical roguelike fashion FTL eschews modern graphics, instead favouring pixel art styling for everything. As far as I can tell they’re actually vector based images as rendering them on my 1680 x 1050 screen didn’t give me the huge pixel blocks that I usually get with titles like this which is a pretty great achievement. The simple, clean art style also helps immensely with the game play as it’s much easier to distinguish everything on screen, something which can be crucial when you’re in the middle of a battle and clicking wildly. The UI elements are also straight forward and their functions clear further adding to FTL’s overall usability. It really pleases me when a game manages to get the graphics and UI right without being too over the top as I can’t tell you how many times a bad interface has soured me on the whole game experience. FTL’s game play is your run of the mill Rougelike dungeon affair with you moving from beacon to beacon, each of which is randomly generated and contains things like an event, an enemy ship or simply nothing. Depending on the choices you’ve made in what to upgrade, what kind of crew members you have and even what weapons you have equipped the events (and the way they play out) will change which means that no two play throughs will ever be a like. This is both a blessing and a curse of the genre as whilst you’ll never be playing the same game twice this does mean that you’ll often find yourself in situations that you’ve never been in before and should you make the wrong choices you’ll be doing it all again in no short order. For the most part you’ll spend your time fighting other ships with varying levels of weaponry, configurations and additional abilities that are sure to make your life far more difficult than it should be. Whilst the combat occurs in real time there it’s still in essence turn based thanks to the time limits placed on all actions you can take. In the beginning the scales are most certainly stacked in your favour as you have several times the hull of any enemy ship and can usually take them out with a well placed missile, leaving you to clean them up at your leisure. This doesn’t last particularly long however and you’ll soon find yourself waging a battle on several different fronts. The combat system is actually quite detailed with many viable strategies available. The initial ship you’re given, The Kestrel, is a pretty typical “blast them until they stop moving” type of craft which is optimized for taking out their shields with a missile and then pummelling them with your laser. Other ship configurations, which you unlock by completing certain achievements, focus on different ways of taking out the enemy. The first (and currently only) ship that I unlocked uses an ion canon to disable enemy systems whilst a single drone wears them down. Others focus on boarding parties where your crew is teleported to the other ship to wreck havoc which usually requires careful micromanagement to pull off correctly. These are just the main types of combat as there’s a lot more variation if you include the different types of weapons and drones, each of which can have devastating effects if used correctly. I spent most of my time on the Kestrel, favouring to upgrade my shields initially to prevent most of the early hull damage whilst looking for some kind of weapon to give me the edge. I’d usually end up keeping one missile around in order to disable their shields so I could then unleash with my other weapons but I did have a lot of success with 2 lasers and 1 beam weapon which would usually let me drop their shields before doing a lot of sweeping damage to them. The issue with this was that it was something of a one trick pony and direct hits to the shields or weapons systems usually left me rather vulnerable so it was always a race to disable their weapons first before they could do it to me. Now I know this is probably going to sound like I’m missing the point of the roguelike genre but the fact is that a good chunk of this game (I’d say about 50% or so) is pure, unadulterated luck. There were several times when after my first jump in a new game I’d find myself in an asteroid field or next to a sun that’s about to go nova which would do enormous amounts of hull damage to my ship before I could escape. This then put me on the back foot as I’d have to use my scrap for repairs rather than upgrades which usually meant even more hull damage and thus the cycle goes. Sometimes it swung the other way with FTL coughing up a weapon that was seriously broken for when I got it, effectively enabling me to take down all sorts of foes without having to pay too much attention to strategy. Many will argue that this is part of the fun but I’ve got one story that I feel proves my point somewhat. So I had gotten to the final stage with an amazing ship, nearly full compliment of crew and all the missiles and hull I could want. Not wanting to lose this game I hunted around for the save game files and copied them off (yeah, yeah, I know) before heading off towards the final mission. Upon reaching it I did pretty well but didn’t make it past the first phase and so I reloaded it and tried again. I did this no less than 20 times and whilst I got the first stage down pat it appears the second stage still eludes me. Without doing that I would’ve had to have invested a lot more time to get to that point and there would be no guarantees that I could get there with a similarly decked out ship. Essentially, if I was playing the game normally, I wouldn’t have had the same opportunity to learn the boss fight if I hadn’t jacked my save game which irritates me. I know a lot of people enjoy this kind of challenge but after a while I have to say the hour long build up to inevitable demise started to wear on me. 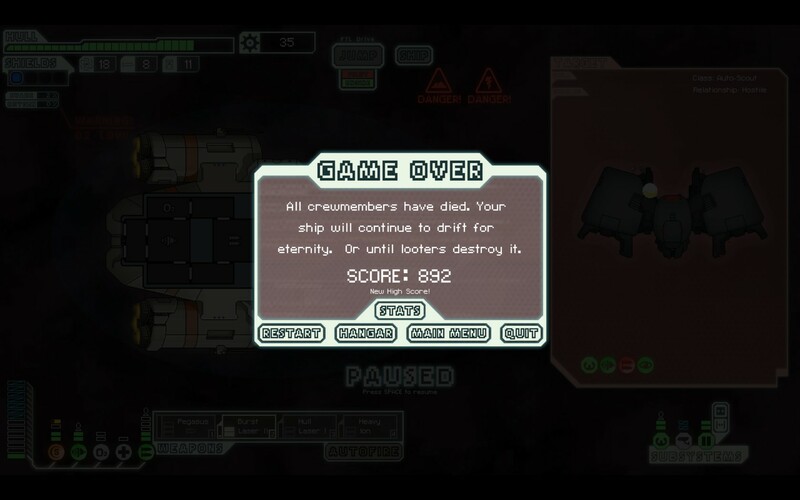 Despite my misgivings with the Rougelike genre I really did enjoy FTL: Faster Than Light for what it is. When I started off just getting around without dying was a challenge but later on it was easy for me to get to the final stand without too much hassle. Of course how I did from there was completely dependent on how much the RNG liked me that day but that didn’t stop me from trying time and time again. I’ve still yet to get passed the second phase of the final boss fight but you can rest assured I’ll keep trying. I might not go the whole hog every time (I still have that game saved) but there is a certain satisfaction in playing from start to finish and I’m sure that’s what keeps everyone coming back. 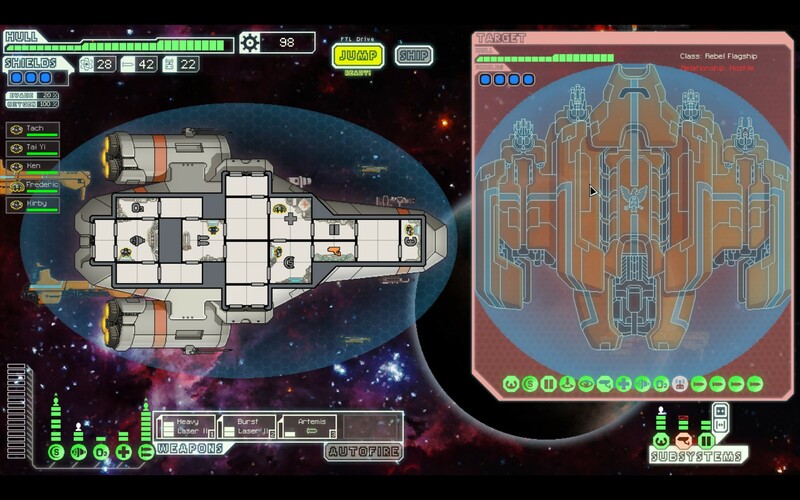 FTL: Faster Than Light is available on PC, OSX and Linux right now for $10. Game was mostly played on the easy difficulty setting with around 7 hours total play time.